Espresso Brown Leather Shoulder Bag Bohemian Chic, "Goa Style"
This shoulder bag from India's Varun Manchanda is certain to captivate the boho trendsetter. 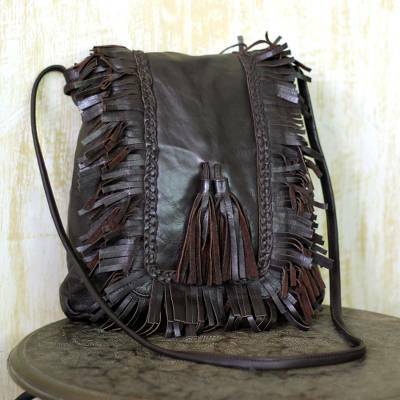 Crafted of supple leather in espresso brown, the bag's flap is adorned with decorative tassels as well as flirty fringe. The bag is completely lined in black cotton and has two open pockets on one side, and a zipper pocket on the opposite side.